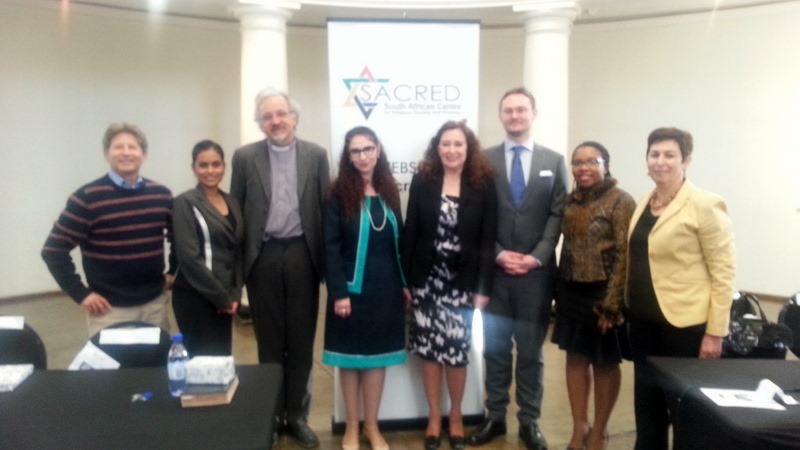 SACRED—the South African Centre for Religious Equality and Diversity—returned to its roots at the Women’s Gaol at Johannesburg’s Constitution Hill , presenting a programme called “The Role of Women in Religious Leadership.” Representatives of Protestant, Baha’i and Cape Town’s Open Mosque joined Rabbi Julia Margolis. In her keynote address, Rabbi Margolis pointed out the difficult road to acceptance as a Jewish leader—a path made easier by the role-model provided by her mother, Rabbi Ylena Rubinstein and earlier women Rabbis including Regina Jonas. Rabbi Margolis and her mother are the first known mother-daughter rabbinic dynasty. Zaakhira Akram, a practicing lawyer, represented the now two-month old Open Mosque. She spoke with passion of the shifting social norms the innovative Mosque represents, in which females enter, pray, study and lead alongside men. Her mention of a perceived obligation for practitioners of Islam to blend into their surrounding society, showed a close resemblance to the beginnings of Progressive Judaism in the 19th century. A common theme amongst the three main Abrahamic religions was that many of the obstacles in the path of full acceptance of female religious leaders derive, not from foundational texts, but from later interpretations. Another theme was the vital importance of female education, which was particularly highlighted by Khwezi Fudu Cenenda from the Baha’i Office of Public Affairs. The session revealed that each of the represented faith communities has reached a different stage in the roles women take and the acceptance if female leadership. Other participants included Reeva Forman as facilitator, a musical meditation by Rabbi Saar Shaked and Rev. Lutz Ackermann (Lutheran Church of Peace, Hillbrow). 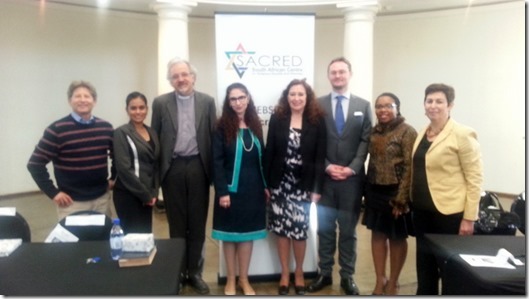 From left to right: Desmond Sweke – chairman of Bet David Progressive Synagogue, Zaakirah Akram from the Open Mosque, Rev’d Lutz Ackermann from the Lutheran Church of Peace in Hillbrow, Rabbi Julia Margolis from Bet David Current Chairperson of SACRED, Reeva Forman – MC, James Lomberg – executive director of the South African Centre for Religious Equality and Diversity (SACRED), Khwezi Fudu-Cenenda from the Baha’i Office of Public Affairs and Leah Livni – Past Chairperson of SACRED.